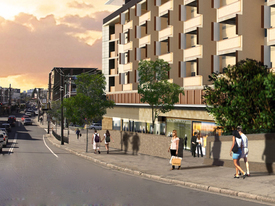 29 Commercial Real Estate & Properties in Marrickville are listed in 5 categories. We have 12 Industrial Warehouses Sale & Lease , 9 OfficesSale & Lease , 5 Retail ShopsSale & Lease , 3 Medical and Consulting PropertiesSale & Lease and 1 Development LandsSale & Lease . Creative Working Environment | Collaborative Space | Abundance Of Natural Light $171pw | 1 Person Workspa..
PROPERTY OVERVIEW $171pw Price incl. OPEN NOW! Introducing a brand new premium sublet office in Marrickville offering private suites and desks for rent for 1 5 people. Perfect for entrepreneurs, freelancers and small businesses working or living in Sydney’s Inner West, this fresh creative hub is about to set a new benchmark in design and facilities. It incorporates equipped meeting rooms and stunning event space to make sure every member can attract clients, build their name and grow their business in a beautiful light filled environment. You’ll enjoy round the clock access to your office space as well as fast Wi Fi, full existing furniture, storage space and access to printing and scanning facilities. The fully managed centre has dedicated receptionists to support your day to day and there are comfy breakout areas and a kitchen with free tea and coffee. Opening in October 2018 and 90% completed, this sublet office is ready to be toured! Book in today and be among the first to claim your spot in this awesome space. Flexi memberships for short and long terms! This large brick building is about to be associated with the most creative and innovative minds in the Inner West. Somewhat deceptive from the street, it features outstanding facilities including showers, bike racks and top level security. There is also some onsite parking and plenty of street parking to ease you into your morning. The office is right next to the Hungry Goat Cafe – a hidden gem that serves delicious sandwiches, salads and the best coffee in Marrickville – and Anytime Fitness, which will soon be swarming with active like minded coworkers. It’s close to the vibrant heart of Marrickville where great eateries and shops are forming a sociable cafe culture and it benefits from a convenient position between Sydenham Railway Station (750m) and Marrickville Railway Station (1.1km). The advertised office space is perfect for a team of 1. If you need more or less space, we have over 30,000 furnished workspaces all over the world suitable for a team of 1 to 200+. Our award winning team offer a free service that will help you find the perfect solution for your needs, so reach out if you need more help. What you get for your weekly rent , 24/7 Access , 24/7 Security , Newest premium co working and shared office space , Access to internal breakout areas , Access to kitchen facilities , Access to secure printer and scanner , Building outgoings included , Electricity usage included , One simple bill for everything related to your workspace , Regular cleaning , Secure high speed Internet , Your own receptionist and waiting area for your clients Building features , Abundance of natural light , State of the art design facilities with premium fit out , Air conditioning , Boutique low rise buidling , Company Branding in Foyer %26 Reception , Concierge on ground floor , Print, scan and copy facilities , Taxi / Uber stand close to building 400m to Sydenham train station 10 mins from Wicks Park 400m to Faros Bros Seafoods WHO IS OFFICE HUB? Office Hub has largest collection of shared office space, sublet office space, creative coworking office space and serviced offices, perfect for 1 200 employees. Let us take you on a tour of all the spaces that fit your needs and budget. Our service is complimentary and we work for you and the landlord to negotiate the most competitive deal in the market. Let us show you how shared and serviced offices can be the perfect solution for your business. www.office hub.com.au www.office hub.co.nz Conditions apply A portion of the square meterage factors in access to shared space. The advertised price includes any incentives offered based on a 12 month agreement. If a shorter period is agreed to please note the price may increase accordingly. This promotional offer for new tenants only and may be withdrawn at any time due to space availability. Gunning Real Estate is pleased to presend this affordable private office for lease. The property is just 350m from Sydenham train station and 500m from Marrickville retail district. The property features 2 partitioned spaces with common toilet facilities. KEY FEATURES: Internal area: 32sqm Great natural light Common toilets available Suits many uses Please contact William Wu (0450 250 123) for further info or inspection. All figures above are approximate. In arguably one of the best positions on Marrickville Road, Taylor Nicholas exclusively presents this beautifully styled practice with features that include: Quality fit out perfect for medical, legal, accounting, beauty, training uses Attractive reception and waiting area with multiple consult, private and staff rooms Air conditioned, dual toilets (incl accessible), multiple wet areas, kitchen 4 undercover car spaces with internal access Surrounded by cafes & services and a short walk to Sydenham and Marrickville train stations Nothing else required but THE RIGHT BUSINESS! Convenient Location | Fitted And Furnished | Creative Space $495pw | 5 Person Workspa..
PROPERTY OVERVIEW $495pw Price incl. Spacious, light filled and eco friendly coworking space in Marrickville where creatives and young professionals can find a small community of kindred spirits. Rent a dedicated desk, catch up with clients in the private boardroom and chat with other freelancers and business owners as you work on your passion. The environment is casual yet professional with music playing and the gentle buzz of activity from the street keeping things from getting too quiet. Have a dog? If they’re friendly, bring them along – they’ll be showered in pats and praise. This secure space is filled with comfy mismatched furniture, unique art and quirky ornaments and it’s split into breakout areas, large kitchen and a coworking area with nine desks, which keeps the group small and close knit. It all makes for a great energy that isn’t too distracting or intense; this is a relaxing and professional haven with a small supportive community to help you produce your best work. Flexible terms available starting from one month – book a tour today to discover a coworking space in the Inner West that’s a bit more “you”. This boutique Inner West coworking space sits on the first floor of a small commercial building right in the middle of Marrickville with off street parking and close amenities. Perched above a row of local shops, it enjoys a good buzz from the busy high street and close access to great coffee, restaurants and bars, not to mention the best Vietnamese rolls in Sydney! The corner building benefits from great natural light, it's open 8am 8pm seven days a week and it’s opposite the Royal Exchange Hotel – get ready to enjoy your new local in this friendly Sydney suburb. Public transport options are great too as the bus stop opposite the building has services running to Sydney CBD, the airport, Bondi, Sydenham and more, and both Marrickville and Sydenham train stations are within 10 minutes’ walk. There is also abundant off street parking so if this shared office space sounds like your kind of thing, you can look forward to a stress free commute no matter whereabouts in Sydney you’re coming from. The advertised office space is perfect for a team of 5. If you need more or less space, we have over 30,000 furnished workspaces all over the world suitable for a team of 1 to 200+. Our award winning team offer a free service that will help you find the perfect solution for your needs, so reach out if you need more help. What you get for your weekly rent , Building outgoings included , Electricity usage included , Dedicated desk with access 7 days/week (8:00am 8:00pm) , Access to internal breakout areas , Access to kitchen facilities , Collaborative space with a great community feel , Flexible lease terms from 1 month , FREE use of the meeting rooms , One simple bill for everything related to your workspace , Plug and play furnished workspace Building features , Car parking Street (Free) , Dedicated men and ladies bathrooms , Direct access to public transport , Gym and fitness centre close by , Open plan layout , Pet friendly office space , Quick access to major airports , Shared office space 750m to Wicks Park 650m to Marrickville Station and 900m to Sydenham Station 6.1km to Sydney Airport Who is Office Hub? Office Hub is the world\'s No.1 marketplace for office space. We have a huge global selection of coworking spaces, serviced offices and shared office spaces with flexible options to suit teams from 1 200 people. We\'ll take you on a tour of all the workspaces that fit your needs and work on your behalf to get the best price possible. We\'ll help you discover how shared office space can be the most beneficial and budget friendly solution for your business. www.office hub.com Conditions apply – the advertised price includes any incentives offered based on a 12 month agreement and is available to new tenants only. Please note that the rental rate may increase for a shorter rental period. A portion of the square meterage factors in access to shared space. Bike Racks & Showers | Collaborative Space | Premium Grade Office Space $243pw | 2 Person Workspa..
PROPERTY OVERVIEW $243pw Price incl. OPEN NOW! Introducing a brand new premium sublet office in Marrickville offering private suites and desks for rent for 1 5 people. Perfect for entrepreneurs, freelancers and small businesses working or living in Sydney’s Inner West, this fresh creative hub is about to set a new benchmark in design and facilities. It incorporates equipped meeting rooms and stunning event space to make sure every member can attract clients, build their name and grow their business in a beautiful light filled environment. You’ll enjoy round the clock access to your office space as well as fast Wi Fi, full existing furniture, storage space and access to printing and scanning facilities. The fully managed centre has dedicated receptionists to support your day to day and there are comfy breakout areas and a kitchen with free tea and coffee. Opening in October 2018 and 90% completed, this sublet office is ready to be toured! Book in today and be among the first to claim your spot in this awesome space. Flexi memberships for short and long terms! This large brick building is about to be associated with the most creative and innovative minds in the Inner West. Somewhat deceptive from the street, it features outstanding facilities including showers, bike racks and top level security. There is also some onsite parking and plenty of street parking to ease you into your morning. The office is right next to the Hungry Goat Cafe – a hidden gem that serves delicious sandwiches, salads and the best coffee in Marrickville – and Anytime Fitness, which will soon be swarming with active like minded coworkers. It’s close to the vibrant heart of Marrickville where great eateries and shops are forming a sociable cafe culture and it benefits from a convenient position between Sydenham Railway Station (750m) and Marrickville Railway Station (1.1km). The advertised office space is perfect for a team of 2. If you need more or less space, we have over 30,000 furnished workspaces all over the world suitable for a team of 1 to 200+. Our award winning team offer a free service that will help you find the perfect solution for your needs, so reach out if you need more help. What you get for your weekly rent , 24/7 Access , 24/7 Security , Newest premium co working and shared office space , Access to internal breakout areas , Access to kitchen facilities , Access to secure printer and scanner , Building outgoings included , Electricity usage included , One simple bill for everything related to your workspace , Regular cleaning , Secure high speed Internet , Your own receptionist and waiting area for your clients Building features , Abundance of natural light , State of the art design facilities with premium fit out , Air conditioning , Boutique low rise buidling , Company Branding in Foyer %26 Reception , Concierge on ground floor , Print, scan and copy facilities , Taxi / Uber stand close to building 400m to Sydenham train station 10 mins from Wicks Park 400m to Faros Bros Seafoods WHO IS OFFICE HUB? Office Hub has largest collection of shared office space, sublet office space, creative coworking office space and serviced offices, perfect for 1 200 employees. Let us take you on a tour of all the spaces that fit your needs and budget. Our service is complimentary and we work for you and the landlord to negotiate the most competitive deal in the market. Let us show you how shared and serviced offices can be the perfect solution for your business. www.office hub.com.au www.office hub.co.nz Conditions apply A portion of the square meterage factors in access to shared space. The advertised price includes any incentives offered based on a 12 month agreement. If a shorter period is agreed to please note the price may increase accordingly. This promotional offer for new tenants only and may be withdrawn at any time due to space availability. Central Location | Shared Space | Economical Workspace $99pw | 1 Person Workspac..
PROPERTY OVERVIEW $99pw Price incl. Spacious, light filled and eco friendly coworking space in Marrickville where creatives and young professionals can find a small community of kindred spirits. Rent a dedicated desk, catch up with clients in the private boardroom and chat with other freelancers and business owners as you work on your passion. The environment is casual yet professional with music playing and the gentle buzz of activity from the street keeping things from getting too quiet. Have a dog? If they’re friendly, bring them along – they’ll be showered in pats and praise. This secure space is filled with comfy mismatched furniture, unique art and quirky ornaments and it’s split into breakout areas, large kitchen and a coworking area with nine desks, which keeps the group small and close knit. It all makes for a great energy that isn’t too distracting or intense; this is a relaxing and professional haven with a small supportive community to help you produce your best work. Flexible terms available starting from one month – book a tour today to discover a coworking space in the Inner West that’s a bit more “you”. This boutique Inner West coworking space sits on the first floor of a small commercial building right in the middle of Marrickville with off street parking and close amenities. Perched above a row of local shops, it enjoys a good buzz from the busy high street and close access to great coffee, restaurants and bars, not to mention the best Vietnamese rolls in Sydney! The corner building benefits from great natural light, it's open 8am 8pm seven days a week and it’s opposite the Royal Exchange Hotel – get ready to enjoy your new local in this friendly Sydney suburb. Public transport options are great too as the bus stop opposite the building has services running to Sydney CBD, the airport, Bondi, Sydenham and more, and both Marrickville and Sydenham train stations are within 10 minutes’ walk. There is also abundant off street parking so if this shared office space sounds like your kind of thing, you can look forward to a stress free commute no matter whereabouts in Sydney you’re coming from. The advertised office space is perfect for a team of 1. If you need more or less space, we have over 30,000 furnished workspaces all over the world suitable for a team of 1 to 200+. Our award winning team offer a free service that will help you find the perfect solution for your needs, so reach out if you need more help. What you get for your weekly rent , Building outgoings included , Electricity usage included , Dedicated desk with access 7 days/week (8:00am 8:00pm) , Access to internal breakout areas , Access to kitchen facilities , Collaborative space with a great community feel , Flexible lease terms from 1 month , FREE use of the meeting rooms , One simple bill for everything related to your workspace , Plug and play furnished workspace Building features , Car parking Street (Free) , Dedicated men and ladies bathrooms , Direct access to public transport , Gym and fitness centre close by , Open plan layout , Pet friendly office space , Quick access to major airports , Shared office space 750m to Wicks Park 650m to Marrickville Station and 900m to Sydenham Station 6.1km to Sydney Airport Who is Office Hub? Office Hub is the world\'s No.1 marketplace for office space. We have a huge global selection of coworking spaces, serviced offices and shared office spaces with flexible options to suit teams from 1 200 people. We\'ll take you on a tour of all the workspaces that fit your needs and work on your behalf to get the best price possible. We\'ll help you discover how shared office space can be the most beneficial and budget friendly solution for your business. www.office hub.com Conditions apply – the advertised price includes any incentives offered based on a 12 month agreement and is available to new tenants only. Please note that the rental rate may increase for a shorter rental period. A portion of the square meterage factors in access to shared space. Creative Working Environment | Cafes And Shops Nearby | Abundance Of Natural Light $324pw | 3 Person Workspa..
PROPERTY OVERVIEW $324pw Price incl. OPEN NOW! Introducing a brand new premium sublet office in Marrickville offering private suites and desks for rent for 1 5 people. Perfect for entrepreneurs, freelancers and small businesses working or living in Sydney’s Inner West, this fresh creative hub is about to set a new benchmark in design and facilities. It incorporates equipped meeting rooms and stunning event space to make sure every member can attract clients, build their name and grow their business in a beautiful light filled environment. You’ll enjoy round the clock access to your office space as well as fast Wi Fi, full existing furniture, storage space and access to printing and scanning facilities. The fully managed centre has dedicated receptionists to support your day to day and there are comfy breakout areas and a kitchen with free tea and coffee. Opening in October 2018 and 90% completed, this sublet office is ready to be toured! Book in today and be among the first to claim your spot in this awesome space. Flexi memberships for short and long terms! This large brick building is about to be associated with the most creative and innovative minds in the Inner West. Somewhat deceptive from the street, it features outstanding facilities including showers, bike racks and top level security. There is also some onsite parking and plenty of street parking to ease you into your morning. The office is right next to the Hungry Goat Cafe – a hidden gem that serves delicious sandwiches, salads and the best coffee in Marrickville – and Anytime Fitness, which will soon be swarming with active like minded coworkers. It’s close to the vibrant heart of Marrickville where great eateries and shops are forming a sociable cafe culture and it benefits from a convenient position between Sydenham Railway Station (750m) and Marrickville Railway Station (1.1km). The advertised office space is perfect for a team of 3. If you need more or less space, we have over 30,000 furnished workspaces all over the world suitable for a team of 1 to 200+. Our award winning team offer a free service that will help you find the perfect solution for your needs, so reach out if you need more help. What you get for your weekly rent , 24/7 Access , 24/7 Security , Newest premium co working and shared office space , Access to internal breakout areas , Access to kitchen facilities , Access to secure printer and scanner , Building outgoings included , Electricity usage included , One simple bill for everything related to your workspace , Regular cleaning , Secure high speed Internet , Your own receptionist and waiting area for your clients Building features , Abundance of natural light , State of the art design facilities with premium fit out , Air conditioning , Boutique low rise buidling , Company Branding in Foyer %26 Reception , Concierge on ground floor , Print, scan and copy facilities , Taxi / Uber stand close to building 400m to Sydenham train station 10 mins from Wicks Park 400m to Faros Bros Seafoods WHO IS OFFICE HUB? Office Hub has largest collection of shared office space, sublet office space, creative coworking office space and serviced offices, perfect for 1 200 employees. Let us take you on a tour of all the spaces that fit your needs and budget. Our service is complimentary and we work for you and the landlord to negotiate the most competitive deal in the market. Let us show you how shared and serviced offices can be the perfect solution for your business. www.office hub.com.au www.office hub.co.nz Conditions apply A portion of the square meterage factors in access to shared space. The advertised price includes any incentives offered based on a 12 month agreement. If a shorter period is agreed to please note the price may increase accordingly. This promotional offer for new tenants only and may be withdrawn at any time due to space availability. Combine your work space, office and storage needs into a modern and functional studio / warehouse unit. A business premise offering a unique working lifestyle. Covered roller door providing all weather loading. Quality 45sqm Mezzanine Office with large glass facade. Carpeted and Air conditioned office. Private kitchenette. Security cameras to all units. High speed internet connection. 3 Phase power. Designated external waste and recycling area. Bathroom and shower facilities at either end of the complex. On Site dedicated container drop off zones. Located walking distance to Marrickville Metro Shopping Centre, and a short stroll to both St Peters & Sydenham Railway Stations. These units are the perfect home for small businesses such as creative agencies, artists studios, multi use storage & start ups. Combine your workspace, office and storage needs into a modern and functional work cell. A business premise offering a unique working lifestyle. Unit 15 Warehouse: 47sqm Office: 16sqm 6m internal warehouse clearance. Wide motorised roller doors. Awning over roller door providing all weather loading. Quality Mezzanine Office with floor to ceiling glass facade. Carpeted and Air conditioned office. Private kitchenette. Security cameras to all units. High speed internet connection. 3 Phase power. Designated external waste and recycling area. Bathroom and shower facilities at either end of the complex. On Site dedicated container drop off zones. Located walking distance to Marrickville Metro Shopping Centre, and a short stroll to both St Peters & Sydenham Railway Stations. These units are the perfect home for small businesses such as creative agencies, artists studios, multi use storage, start ups or the ideal home for your prestige vehicle or motorbike collection (designed on a grid of 4.3 wide x 11m deep to comfortably accommodate 2 vehicles). Combine your workspace, office and storage needs into a modern and functional work cell. A business premise offering a unique working lifestyle. Unit 26 Warehouse: 47sqm Mezzanine Office: 16sqm 6m internal warehouse clearance Wide motorised roller doors Awning over roller door providing all weather loading Quality Mezzanine Office with floor to ceiling glass facade Carpeted and Air conditioned office Private kitchenette Security cameras to all units High speed internet connection 3 Phase power Designated external waste and recycling area Bathroom and shower facilities at either end of the complex On Site dedicated container drop off zones Located walking distance to Marrickville Metro Shopping Centre, and a short stroll to both St Peters & Sydenham Railway Stations. These units are the perfect home for small businesses such as creative agencies, artists studios, multi use storage, start ups or the ideal home for your prestige vehicle or motorbike collection (designed on a grid of 4.3 wide x 11m deep to comfortably accommodate 2 vehicles). A quality industrial unit offering functional warehousing with modern office accommodation. Benefits include: wide driveways, shaded dedicated parking, and easy access through the estate. Unit 8 Warehouse: 70sqm Office: 25sqm 7m internal warehouse clearance 3.5m wide motorised roller shutter door Awning over roller shutters providing all weather loading Quality Mezzanine Office with floor to ceiling glass facade Individual bathroom with provision for shower kitchenette facilities Undercover car parking Security cameras to all units High speed internet connection 3 phase power supply Designated waste and recycling areas Dedicated container drop off zone Located walking distance to Marricville Metro Shopping Centre, and a short stroll to both St Peters & Sydenham Railway Stations. Combine your workspace, office and storage needs into a modern and functional work cell. A business premise offering a unique working lifestyle. 6m internal warehouse clearance Wide motorised roller doors Awning over roller door providing all weather loading Quality Mezzanine Office with floor to ceiling glass facade Carpeted and Air conditioned office Private kitchenette Security cameras to all units High speed internet connection 3 Phase power Designated external waste and recycling area Bathroom and shower facilities at either end of the complex On Site dedicated container drop off zones Located walking distance to Marrickville Metro Shopping Centre, and a short stroll to both St Peters & Sydenham Railway Stations. These units are the perfect home for small businesses such as creative agencies, artists studios, multi use storage, start ups or the ideal home for your prestige vehicle or motorbike collection (designed on a grid of 4.3 wide x 11m deep to comfortably accommodate 2 vehicles). A brand new quality industrial unit offering functional warehousing with modern office accommodation. Benefits include: wide driveways, undercover parking, and easy access through the estate. 7m internal warehouse clearance 3.5m wide motorised roller shutter door Awning over roller shutter door providing all weather loading Quality Mezzanine Office with floor to ceiling glass facade Inviting stair and entry lobby area Individual bathroom and kitchenette facilities Sun screened allocated car parking Intercom access entry door Security cameras to all units High speed internet connection 3 phase power supply Exclusive external waste and recycling areas Dedicated container drop off zone CONSTRUCTION TO BE COMPLETED BY EARLY 2018 Located walking distance to Marricville Metro Shopping Centre, and a short stroll to both St Peters & Sydenham Railway Stations. Unique opportunity to lease this private and secure treatment room located within a busy dental surgery You Get! Ideal location Highly exposed ground floor frontage Signage opportunities Shared reception Private and secure room Air conditioning Shared facilities Private sink located within treatment room Ideal space for all medical or therapeutic uses. #Prime corner position in this brand new retail destination in Inner West hot spot Marrickville# :: Shop 1 is 139sqm with access to grease trap & exhaust :: Potential for outdoor terrace (STCA) :: 7.2m glass frontage facing directly up Illawarra Road & a great feel Captivate commuters right next door to upgraded Marrickville Railway Station plus 179 residential units above Be part of the Retail Revolution Call 1300 325 327 to book a viewing today. Creative Studio - Short Term Lease $1,000 + GST per week inc.. Available for a short term lease (3 4 months), this large building presents well and has a lot of character, suitable for for a variety of uses such as photographic studio, artists gallery, creative studio and much more. Originally used as a dance hall and most recently for SES operations. Currently configured as a large open area plus 5 separate rooms, kitchen, separate dual male and female bathrooms and internal access to spacious garage. Offers an impressive 900sqm approx land size, and 300sqm approx internal. Dual street frontage and is zoned R1. Includes a garage, plus there is extra room for off street parking in front. ~ Warehouse approx 715sqm. ~ Pallet racking with sprinklers installed for approx. 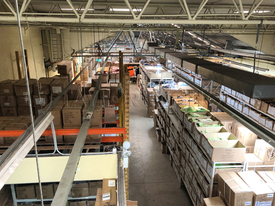 752 pallets (please note the pallet racking can not be removed and it is double stacked racking). Carrington Rd, Marrickville is within 8km from the City, 5km of Port Botany and Sydney Airports and minutes from the M5 service ramps and is within walking distance to both Sydenham, Marrickville and Tempe railway stations. 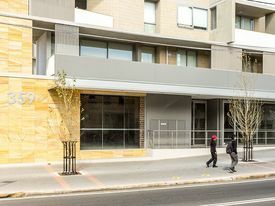 :: Professional services or medical tenancy wanted to complement this brand new retail destination in Inner West hot spot Marrickville. :: Shop 2 is 122sqm with high visibility window space for branding or display plus double door access from Illawarra Road :: Captivate commuters right next door to upgraded Marrickville Railway Station plus 179 residential units above. Call 1300 325 327 & book a viewing today. ## Cutting edge retailer to fit this brand new retail destination in Inner West hot spot Marrickville :: Shop 3 is 80sqm with full glass windows & 7.2m frontage visible clearly from Illawarra Road Captivate clients & commuters right next door to upgraded Marrickville Railway Station. Call 1300 325 327 & book a viewing today. Front and centre position in this brand new retail destination in Inner West hot spot Marrickville. :: Shop 5 is 87sqm clean open space with high ceilings, grease trap and exhaust :: Shop 5 has a 7.2m full glass frontage opening to a wide terrace with potential for +30 seats (STCA) Captivate commuters right next door to upgraded Marrickville Railway Station plus 179 residential units above. Be part of the Retail Revolution. Call 1300 325 327 and book a viewing today.